Our CCTV DVRs provide the ideal recording from traditional CCTV Cameras (analog). These digital recorders connect to any brand analog CCTV camera, and each of our recorders provide remote access capabilities to allow you to see your cameras on iPhone, Android and more. These DVRs provide motion detection recording capabilities for 4, 8 or 16 traditional CCTV cameras. This new model Standalone DVR also has Zero-configuration remote access, allowing immediate remote access, without configuration of difficult network settings. Watch your cameras live on an Android, iPhone, Windows or Mac instantly from anywhere in the world. Our AVM System provides industry-leading capabilities for your home or business security cameras. 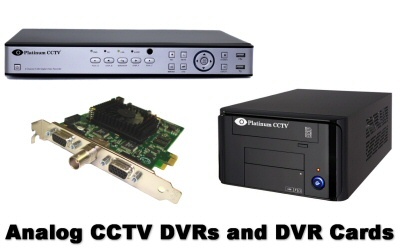 These DVRs run our AVM software, and can be purchased as a DVR card and software to install into your Windows PC, or purchased as a complete system alternately for even easier setup. The AVM platform provides improved motion sensitivity adjustment (9000 levels per camera) + Improved remote access (iPhone, Android, BlackBerry, Windows Phone, PC, Mac) + easiest video searching and playback in the industry (scan through days of video in seconds to visually find an event). This platform is the ultimate for recording from your CCTV cameras and is expandable to all types of cameras (HD-IP, HD-SDI, Analog).